LobsterGuy's Gallon Of Clam Chowder is chock full of tender sweet clams, with just the right amount of potatoes in a rich flavorful broth! Simply put, you're going to love This Award Winning Chowder! 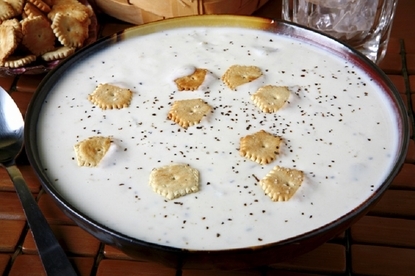 Order Our Gallon Of Award Winning Clam Chowder By 10am EST, And Enjoy It For Dinner Tomorrow! Our Chowder Also Make A Great Gift Idea For Your Favorite Seafood Lover! How Easy Is That! everything we got from these guys are the best. got lobster and chowder. love it all. thank you guys. We ordered lobsters and chowder, and received them on 9/12/2015. Everything went great, they arrived on time, the ice packs were still solid ice, and much to my pleasure, the lobsters were as large (if not even larger) than I thought they would be. The chowder was very, very good, again better than expected. Our dinner guests all wanted to know where we got everything, dinner was a big hit thanks to THE LOBSTER GUY. Thank You and we will be ordering from you again. We took this chowder to our sons football game as our lunch. We ran out! One gentleman dumped out his coffee cup and filled it with chowder! It was so good! Expect lots of business from Texas! I don't know who came up with this recipe, but I WANT IT! Wow is this good! We will be ordering more, today!